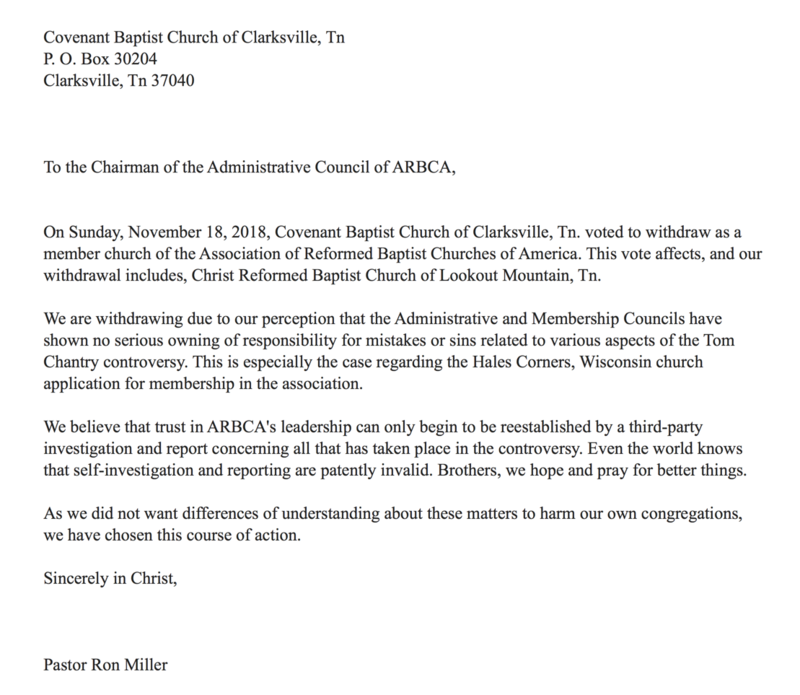 I know that many of you are not on Twitter, where I generally provide more timely updates, so I wanted to post this information on my blog to let you know that churches are continuing to resign from ARBCA. In my opinion, this is a good thing and I find it encouraging to know that there are still a lot of good churches and pastors out there that value truth and integrity and will do the right thing. 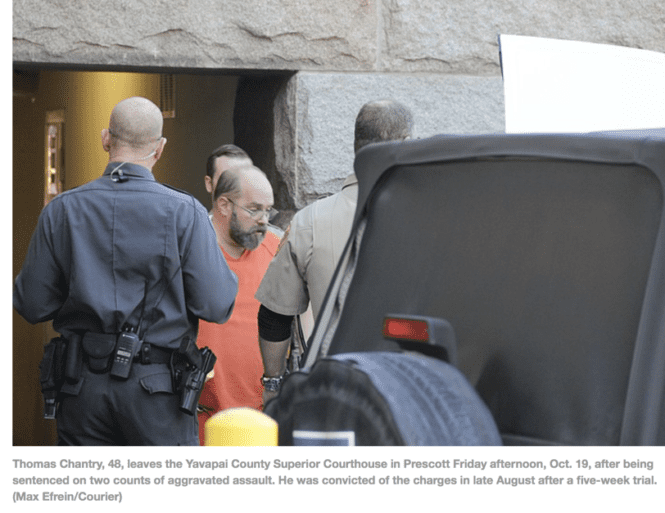 So while Tom Chantry has been in the Yavapai County jail for the last two months, his legacy continues to grow. 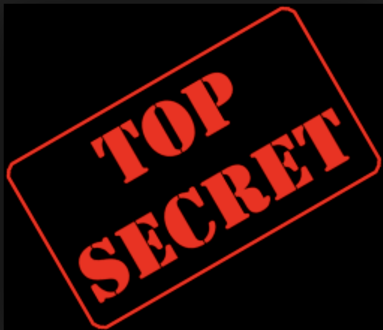 It appears most of the churches who have resigned from ARBCA have done so because of the Tom Chantry abuse scandal and what pastor John Giarrizzo admitted was a coverup of Chantry’s crimes. (If you would like to view these letters of resignation in PDF format you can go here and here. 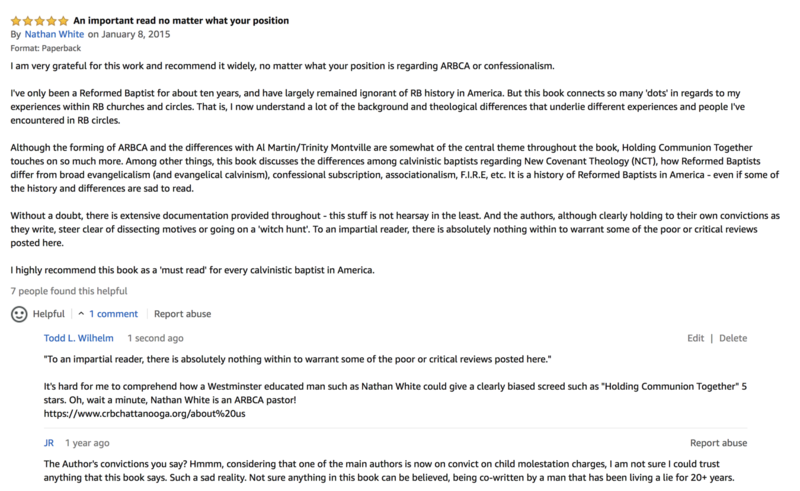 Below is a screenshot of Nathan White’s review and a comment I made in response to his review. I had taken this screenshot because I plan on writing about all the ARBCA leaders who have submitted positive reviews of this book. Included in this group are Al Huber and Steve Martin. At least some churches are distancing themselves from the corruption. What happens when there is renewed attention at the retrial of Chantry? How long can IRBS survive on diminshed funding? And what happens when the civil lawsuits come? 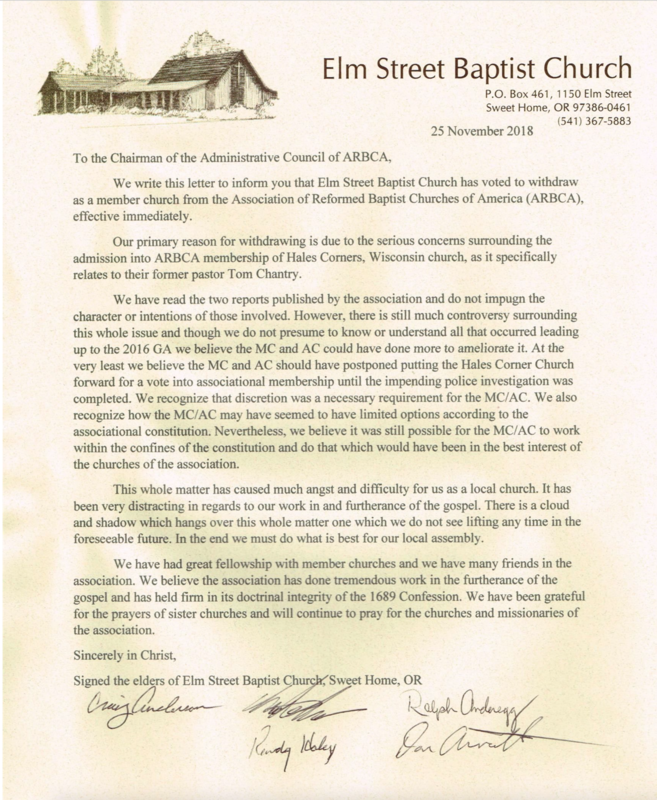 Please forgive me if I am missing something obvious, but the headline to the article says “Three More Churches Resign From ARBCA”, but in the article itself I only see two churches that have resigned from ARBCA: Elm Street Baptist Church and Covenant Baptist Church of Clarksville, TN. If you read the letter from Covenant Baptist Church of Clarksville you will see that they said Christ Reformed Baptist Church of Lookout Mountain also was resigning with them. The Lookout Mountain Church was a church plant of Covenant Baptist Church. Ah. So it does. Thanks! Covenant Baptist Church’s resignation includes the resignation of their church plant Christ Reformed Baptist Church. 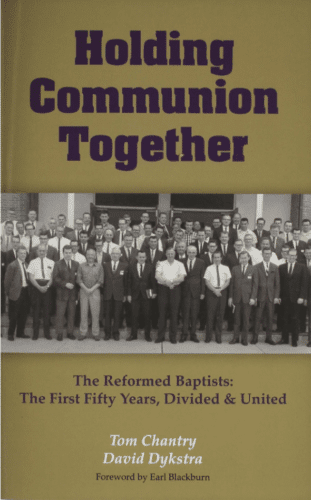 In spite of all its pretensions the Association of Reformed Baptist Churches of America is and always has been a blip on the radar screen of the activity of God among confessionally Reformed and Baptistic churches in America. Today they comprise less than sixty churches in less than thirty States. In New York there are more than a dozen self defining Reformed Baptist Churches I know of with only one in ARBCA. States like New Jersey, Florida, South Carolina and Maryland are home to dozens of churches that have adopted the 1689 London Baptist Confession and not a single one is a member of this allegedly nationwide association. ARBCA was founded in bitter controversy and has been sustained by bitter controversies that have borne the evil fruit of enmity, bitterness, division and exclusion far exceeding any marks of the grace the gospel produces. It is led largely by a coterie of proud men who have used an association to build a name for themselves far in excess of anything their moderate gifts would have otherwise have warranted. 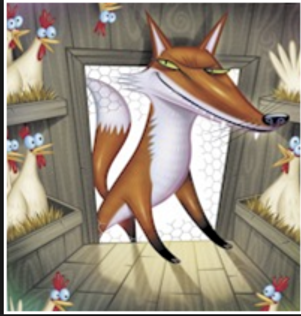 It is good that the hidden corruption has been so publicly revealed. Thorough and humble repentance has not resulted thus far and is unlikely to be forthcoming even in the face of the public humiliation of the Chantry scandal. One can only hope the enterprise will continue to lose adherents and ultimately perish from the foul odor of its own corruption. Thanks for the comment, Paul. I agree. Paul, Dumfounded by your observation of ARBCA! You really summed it up! I am a former ARBCA church member and humbly unlearning those things that pointed me away from Christ and toward my own “disciplined knowledge of truth.” It is devastating to come out of teaching like this that seems so orthodox, but is ultimately man-centered and yields such ugly fruit. Also, so hopeful and thankful to have found that what you say is true. There are other 1689 churches out there to be found. It’s always nice to see you, Lydia. Btw, the article about Dodeka, the reputedly elite, white supremacist organization at The Southern Baptist Theological Seminary, is getting many hits. That’s interesting given the propaganda, in my opinion, that President Al Mohler is producing to play down the Seminary’s especially reprehensible racist history. I imagine that Mohler also had some explaining to do regarding the Seminary’s formal association with at least one Free Mason lodge, as linked to in that article. Like ARBCA, Mohler likes to nitpick about doctrinal issues to distract people from the awful things his wing of the Evangelical pro-profit empire does behind the scenes.